The Arts & Crafts period of architecture in America often called for woodworking in the form of panels, doors, moldings and floors that were created using the, now extinct American Chestnut tree. 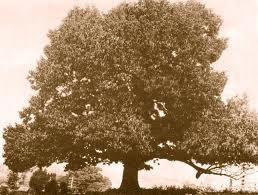 majestic American Chestnut tree, now extinct. When I first stepped into the house almost thirteen years ago, I fell in love with the color, sheen, and richness of the the original Chestnut wood used throughout as the perfect finish to the philosophy of that era; simple, natural, functional beauty. The untouched, vintage setting was probably one of the reasons I decided to make the house mine. The trim moldings that were cut and fitted on site, were as beautiful as they day they were installed. I can picture the busy carpenters using the tools of the craft with perfect precision as they completed every detail fitting around beveled glass and framing of the stained glass windows and doors. My eyes raced back and forth in amazement first at the built-in bookcases between the dining room and living room. 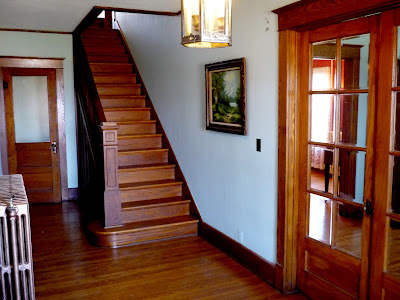 Then, to the French doors in the main hall, the stairway and finally, to the panels and plate rails in the dining room. Corner moldings were used as final appointments even on the third floor. The history of the great American Chestnut is an interesting one. The fact that its wood and fruit provided for and sustained the American people with a variety of uses from early on, up to its demise during the later 1930's. It is sad to know that a blight hit and destroyed this variety of Chestnut tree from the early 1900's to around the 1930's from eastern Canada down the coast to the Carolinas. There is a society and movement to revive and restore the growth of the American Chestnut. I am happy to be the keeper of the beautiful Chestnut wood left by those who worked so artistically and carefully during the last century, to impart its natural beauty here at 1922 Starkey House. I thank all of the owner-keepers before me for preserving it and not painting over it.